Rock-solid telescope support and precise tracking performance in an amazingly portable GoTo mount! 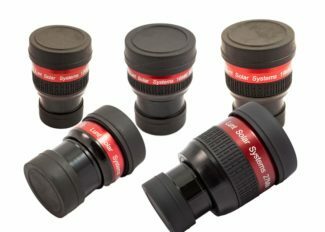 This compact telescope mount combines astrophotography-caliber tracking precision with the ability to hold one or two mid-sized telescopes and a vast computerized database of over 42,000 night-sky targets to explore. The Orion Sirius Pro AZ/EQ-G Mount operates in equatorial GoTo mode holding one telescope, or in altazimuth GoTo & tracking mode with one or two telescopes attached side-by-side. The Orion Sirius Pro AZ/EQ-G Telescope Mount’s whisper-quiet, belt assisted stepper motor drive system can locate any of over 42,000 celestial objects from its computerized hand controller’s database. The motorized mount pinpoints selected targets at an impressive maximum slew speed of 4.2° per second. The closed-loop GoTo system electronics features two sets of optical encoders per axis of motion, meaning once you perform an initial alignment you can manually move the attached telescope to a new target and the mount will still know where it’s pointing in the sky! What’s more, after an inadvertent or intentional nudge, this smart mount can return to its last target or pinpoint any new target you select without requiring realignment. The Orion Sirius Pro AZ/EQ-G Mount presents a perfect combination of compact portability and precise performance with many imaging-friendly features. In equatorial mode, the sturdy Sirius Pro can hold up to 30 lbs. of equipment for stable support of imaging telescopes and trains of astrophotography gear. A narrow, Vixen-style dovetail saddle makes secure telescope attachment nice and easy. In EQ mode, the Sirius Pro dovetail saddle sits 48.7″ above the ground with the pier-tripod legs extended, and 41″ above the ground with legs retracted. Thanks to its low-profile tripod and 0°-90° latitude range, the Orion Sirius Pro AZ/EQ-G Mount can be used in any location on the planet. No matter where your favorite dark sky site is, the Sirius Pro will provide stable telescope support and accurate object-location and tracking for all astrophotographic and visual pursuits. With the capability of supporting two telescopes at once, the Sirius Pro AZ/EQ-G Mount can be used to obtain two views of the night sky simultaneously. The “dual-scope” Altazimuth GoTo & Tracking mode is ideal for star parties and group outreach stargazing sessions, since two people can explore the night sky in tandem as the Sirius Pro precisely tracks night sky objects. What’s more, with a short focal length telescope on one side, and a longer focal length telescope on the opposite side, the Sirius Pro makes it easy to compare wide-field and higher-power views of the sky. In altazimuth mode, both sides of the mount can support up to a 30-lb. telescope. A removable secondary Vixen-style dovetail mounting saddle is included. With the Orion Sirius Pro, you won’t have to worry about cables getting tangled during long imaging sessions, since the built-in ST-4 autoguider port, USB-to-Serial port, and two DSLR shutter control ports are all located on a stationary mount head panel. Threaded motor and power cable jacks ensure connections remain secure. The high-performance Sirius AZ/EQ-G Mount also features Permanent Periodic Error Correction (PPEC) for enhanced guiding accuracy. Convenient, built-in bubble levels help make the initial GoTo alignment process quick and easy. An improved, single-lever altitude adjustment system and large easy-grip R.A. and Dec. axis clutch wheels are delightfully easy to adjust, even while wearing bulky gloves on crisp, clear, and cold nights. The Sirius Pro is a highly transportable, yet seriously sturdy telescope mount. The compact mount and foldable pier-tripod weigh in at 28.8 lbs. without counterweights, and the fully assembled Sirius Pro tips the scales at just 43.8 lbs. with the two included 7.5 lb. counterweights attached. The mount’s counterweight shaft is retractable, and a 4.7″ (12cm) thread-on extension is included for balancing versatility. The low-profile tripod boasts extendable, 1.75″ diameter stainless steel legs that won’t interfere with attached telescopes during tracking. When collapsed, the mount measures just 28″ long with the EQ head attached for easy portability and storage (pier-tripod folds to 25″ long with mount head detached). The computerized Orion Sirius AZ/EQ-G GoTo Telescope Mount requires a 12V DC power supply such as an Orion Dynamo Rechargeable Power Station or an AC-to-DC adapter (both sold separately). Various sizes. Perfect for storing your Astro goodies or for general purpose use. Use the drop down menu to pick by size and view price. Some cases are specific to Lunt Solar products and are available with or without the product foam insert.